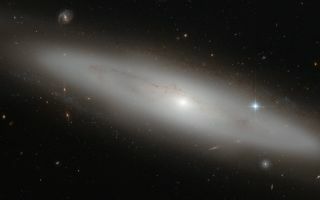 In this space wallpaper—among a crowd of face- and edge-on spiral, elliptical, and irregular galaxies in the constellation of Virgo—lies NGC 4866, which is a lenticular galaxy situated about 80 million light-years from Earth. In this space wallpaper—among a crowd of face- and edge-on spiral, elliptical, and irregular galaxies in the constellation of Virgo—lies NGC 4866, which is a lenticular galaxy situated about 80 million light-years from Earth. Lenticular galaxies are somewhere between spirals and ellipticals in terms of shape and properties. From the picture, we see the bright central bulge of NGC 4866, which contains primarily old stars, but no spiral arms are visible. This image was released July 15, 2013.